Want to maximize your health plan’s recoveries? Of course you do. Here’s how. There’s a great deal of uncertainty in healthcare today, but one thing never changes: health plans’ desire to grow their recoveries. But, stuck dealing with insufficient technology or solutions that are siloed and not well connected, they can’t see the path to get there. We’ve written a lot of content about methods that health plans can use for growing recoveries, and summarized our findings below. Download “Top 10 Ways to Maximize Your Health Plan’s Recoveries” infographic here. 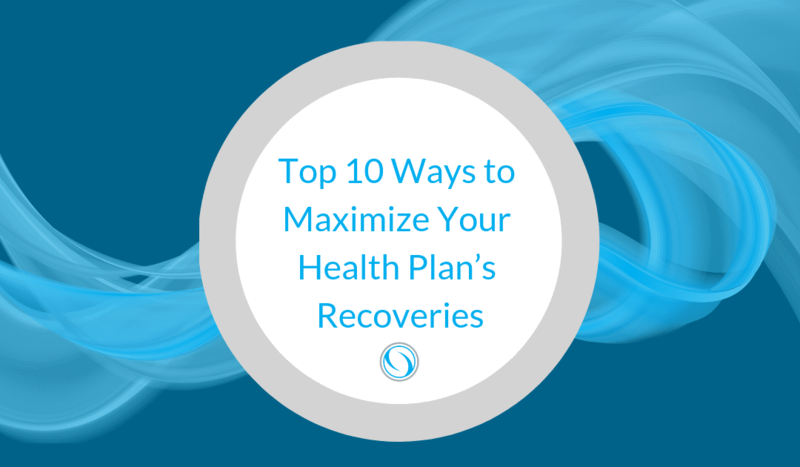 What are the top 10 ways a health plan can maximize their recoveries? Based on conversations with health plans across the nation, below is our roadmap to maximizing your recoveries. These ideas are likely familiar to you, even obvious. But, by leveraging the power of advanced payment integrity technology to put these solutions into play, health plans can grow their rate of recovery from an industry-average 1.2% to 7% or greater. Complex administrative processes cause myriad problems for health plans. Heavy costs associated with unwieldy, manual tasks make controlling claim spend nearly impossible. The cost to coordinate benefits alone is estimated to be $800 million, leaving many health plans wondering what the answer is. Simpler, more efficient processes offer a smoother path to greater recoveries. 2. Add third-party vendors, stacked to greatest effectiveness. Most health plans realize the benefits a third-party business partner brings to the table. The issue, however, is managing multiple vendors. With the right technology, health plans can easily onboard multiple third-party vendors and stack their focused expertise to optimize effectiveness. Are you fully realizing the damage provider abrasion does to your recoveries? Problems with providers (often in the form of poor communication) can cause issues with claims resolution. Denials are costly for everyone, and new regulations aimed at interoperability are making it more important than ever to provide accurate information quickly. Nearly a year ago we wrote, “health plans can maximize the value of third-party payment integrity vendors by factoring in their ability to facilitate research and development operations.” The same is true today, if not truer: concept innovation is at the core of health plan technology disruption. If that’s too edgy for your organization, scaling change across your health plan ecosystem is a very pragmatic yet proactive way to introduce concept innovation to your organization. Large amounts of siloed data are a natural byproduct of the digital healthcare landscape, but gone are the days when “big data” can be managed by spreadsheets alone. Now, health plans need a single source information portal to integrate payment integrity efforts across their organization. Internal efforts can be centralized to improve health plan recoveries by using an advanced technology solution like Pareo®. Have you ever considered your net promoter score (NPS) — with your providers? How would they rank you to peers, and more pressingly, how does this affect your health plan’s ability to grow? Providers can become disengaged and disenchanted when processes (like medical records requests) are redundant or too vague. You can boost your provider NPS by focusing on improving the ways your health plan engages with health care professionals. For instance, Pareo® offers access to real-time data, allowing your plan to resolve questions with providers immediately. Don’t be sold short: there’s more to payment integrity than just claims editing. The right technology solution should offer a return on investment that maximizes recovery efforts in real-time. Pareo® allows health plans and payers to expand internal capabilities, boosting ROI by eliminating unnecessary costs. For instance, reducing administrative work allows your talented staff to take on some post-pay efforts that your health plan may usually outsource. 8. Don’t overlook waste while looking for fraud and abuse. Wasteful spending (defined by Health Affairs as “spending that could be eliminated without harming consumers or reducing quality of care that people receive”) accounts for a third of all healthcare spending in the U.S. But often, technology solutions sold to health plans only focus on fraud which, while important, is much rarer (only 7% of healthcare spending when combined with abuse). Pareo® combats fraud, waste and abuse by utilizing multiple technologies, such as, intelligent claims flagging and automated auditing workflows. Remember the famous Benjamin Franklin quote, “An ounce of prevention is worth a pound of cure.” That’s absolutely true for health plans who want to focus on payment integrity. The key to preventing leakage and bad claims? Optimizing your use of big data, which allows a health plan to make decisions faster, make meaningful progress on payment integrity, set up new value frameworks, deploy predictive modeling, and embrace transparency. If you haven’t already adopted a form of AI technology into your health plan processes, now’s the time. (And if you aren’t sure what AI is — and isn’t — read our primer here.) Integrating systems and processes is key to lowering health plan costs. Advanced technology gives health plans the capability to connect information in a single source portal to eliminate silos and improve efficiencies. In fact, we think health plans are in a better position than any other health organization to adopt and scale meaningful change by embracing technology.